Are in the class Mammalia within the subphylum Vertebrata. Are warm-blooded. They have the ability to maintain their body temperature by internal means. The technical word for this is endothermy. Birds are the only other group of animals in the world that can do this. Have hair. This unique body covering is made of keratin and grows from special cells located in the skin. Some mammals are hairier than others. Marine mammals such as whales may be virtually hairless. Have a four-chambered heart. This is the most advanced kind of heart. It keeps the arterial (oxygenated) and venous (oxygen-depleted) blood completely separate. Have live birth. The monotremes (platypus and echidnas) are exceptions in that they lay eggs. In marsupials, such as the opossum, the young are born in a very primitive state and then finish their development in an external pouch. Have very specialized and diversified teeth. Again, there are some exceptions (monotremes, baleen whales, e.g. ), but the mammals have carried the development of teeth farther than any other group of animals. Have a diaphragm. The diaphragm is the special muscle located below the lungs that draws air into the lungs. This increases the efficiency of breathing. No other type of animal has this muscle. Q: I found a baby animal! > Leave it where you found it. Its parents are staying hidden to keep it safe, and they will be back. Unless the animal is noticeably injured, put the little one back into its nest and leave it alone to give it the best chance at life. But what if the parents smell my scent? The adults are not likely to abandon the nest because of your odor. A rodent has gnawing teeth and can live in many habitats. This is our largest group of mammals, and there's far more than mice in this bunch. What's the largest rodent in Kansas? American Beaver: they can weigh up to 110 lbs. Which Kansas rodent can go for months without drinking water? Ord's Kangaroo Rat: their desert adaptations are intense. They even produce their own water through their metabolism. Which Kansas rodent howls to mark its territory? Northern Grasshopper Mouse: this mouse is 90% carnivorous and howls like a tiny wolf. Which Kansas rodent has a verbal language? Black-tailed Prairie Dog: their barks contain coded information, which makes their chattering a language. They even have regional dialects. Black-tailed prairie dogs, named for their black-tipped tails and dog-like "bark," once lived throughout the Great Plains in "towns" that extended for miles and contained hundreds of thousands of individuals. Bats, our second-largest group of mammals, are the only true flying vertebrates alive today besides birds. Myths and misconceptions stoke our fear of bats, but they're an important part of the ecosystem. What's the deal with rabies? Only a small percentage of bats carry rabies, but they can carry it. Never handle wildlife, including bats, and avoid direct contact with them. Consult with medical professionals if someone you know may have been exposed to a bat. Their free pest control services are worth up to $53 billion each year. Bats eat up to two-thirds their body weight in insects each night, removing thousands of insects from agricultural areas and human residences. How do I attract bats to my backyard? Build a bat house, and keep your cat inside. Bat houses aren't as effective in Kansas as they are in other states but can still attract bats to your neighborhood. Some of our common bats, like Eastern Red Bats, prefer roosting in trees. This deadly invasive bat disease is a fungus that attacks hibernating bats. It was introduced from Europe, so American bats have not developed defenses against it. It was officially documented in Kansas in 2018 and is still spreading across the United States. They see as well as any other mammal, even without their sonar. There are 21 species of armadillo in the world, including the Giant Armadillo that can get up to 71 lbs. The smallest armadillo is called the pink fairy armadillo, it only gets up to 6in in length. They also have really fun names, like the screaming hairy armadillo. The only species that lives in Kansas is the nine-banded armadillo. Armadillos have a natural armor. In fact, its name in Spanish means “little armored one.” That armor is great for protection against predators like coyotes, foxes, and bobcats, but it does little to help them against their number one killer: vehicles. Which is how they got the unfortunate nickname the “Hillbilly Speed Bump,” for their uncanny ability to get hit by cars. Can armadillos curl into an armored ball? It’s true that an armadillo can curl up into a ball, but not all armadillos can. In fact, only one species, the three-banded armadillo, can roll itself up like that. Other species will quickly dig a hole and hunker down so their unarmored, vulnerable stomach is protected. Armadillos are close cousins with anteaters so they share similar characteristics, like pointy snouts, long, sticky tongues, poor eyesight and a highly developed sense of smell. Want to learn more? 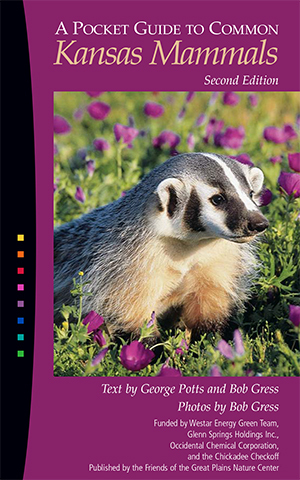 Download our free Pocket Guide to Kansas Mammals! Take it with you on your device wherever you go, or pick up your own pocket-sized copy at our front desk during your next visit.